Sunpentown WC-20TL ThermoElectric 20-Bottle Wine Cooler (March 2019) Review! Sunpentown or SPT provides great quality product and is a trusted brand when it comes to electronic products. Thus, we’ve included Sunpentown WC-20TL in our list of 10 best wine fridge/coolers. It is a great combo of quality product + amazing pricing. The overall look of the product is also great and it is very efficient as well. So let’s get into the details a bit. Starting from the designing point of view, it comes with reflective glass door which looks so cool. The controls are touch sensitive so no more stupid buttons getting messy problems. The overall of color of the product is brownish/black with super sleek finish which looks so awesome. 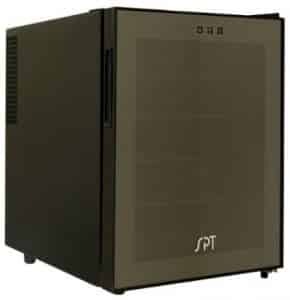 SPT products are known for it’s low power consumption features and this one is also the same. It consumes low power compared to many other products in the same range. You can adjust the temperature from 55F to 66F range to keep your wines in best condition possible. It comes with removable shelves which can hold up to 20 standard sized bottles at a time. You can of course store larger bottles by adjusting the shelves as you like. We’ve researched so many products and different aspects of it. By far this is the best combination of a great product which is compact in size and also doesn’t cost huge. We definitely recommend this to all our readers. If you’d like to read detailed customer reviews from Amazon.com then click here. If you require a bigger freestanding wine cooler then we recommend that you check our review of NewAir AW-281E which can store up to 28 bottles of wine at a time. We’ve also reviewed Haier 6-Bottle Wine Cellar on our site which is a nice low cost solution for starters. If you’d like to check out our list of Best Wine Fridge for Sale in 2019 then click here.